We are pleased to announce a new college-wide BEConnected initiative – an iPad for every student for integration into student life. 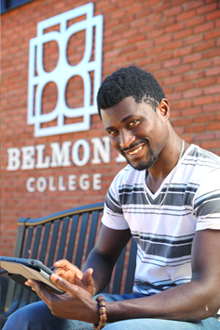 Each student who receives an iPad will have the ability to use it throughout their academic career while enrolled at Belmont College. The purpose of BEConnected is to encourage completion and retention, as well as to enhance the way we teach and prepare students for the technology-driven careers that await them. The initiative will also support our Sustainability Program, as it will greatly reduce the need/cost for books, printing and paper supplies. Q. If we have our own devices, do they need to be an Apple iPad or can it be any kind of tablet – such as a Galaxy? A. The required device needs to be an iPad Air or newer version. The faculty and students will be trained on the use of the iPad and the apps. These apps will be used in class and are specific to apps found in the Apple store. Q. Which version of the iPad will the school be distributing? A. The college will be distributing an iPad Air (32GB). Q. Does this mean there will be no textbooks at all, therefore, no textbook fees? Or how will this work? A. There will still be textbooks, however the goal is to increase the number of blended courses that utilize digital curriculum to reduce or eliminate the cost of textbooks. This process happens over time. Q. Is this an optional program? A. No, all students will be required to participate and have access to an iPad for their coursework. Belmont College is committed to preparing students for the technological workforce and understands the importance of learning technologies. Q. Will all classes be offered on iPads—or will students still have some textbooks? A. The iPad will be used as a tool in the classroom. Students will be encouraged to take notes, access content posted by teachers, access instructional videos and other digital content. Now that each student will have a digital device, instructors will be encouraged to adopt digital content. Q. Will students be able to download additional apps? A. Yes, students will be able to use the iPad for personal use as long as it does not interfere with the educational use of the device. Q. Can students use their own personal iPad? A. No. Due to the unique nature of the iPad, as well as programming and management issues, it is not currently possible for the college to allow individually owned personal iPads. This option may be explored in the future. Q. Will students keep the devices during breaks? A. Students will be able to keep the device as long as they are registered for classes. Devices will be collected at the return date in their user agreement or when they are no longer a student. Q. Will students get to keep the devices after they are no longer enrolled? A. No. The devices must be returned once students are no longer enrolled at Belmont. Q. What happens when new iPad models come onto the market? A. The current cycle for the iPads is three years, at that time we will look at all new options available. Q. Do I have to use an iPad? A. Educational resources and content will be delivered via the iPad. This makes the iPad a necessity for your education. The program also brings individual learning to you and provides you the ability to “connect” with your peers, teachers, and the world. Q. Do I have to have Internet access at home? A. No. Students will be able download the content needed to work off-line. However, while not required, at home internet will assist students in conducting research and collaborating with teachers and classmates outside of the classroom. Q. Will I use the iPad in every course? A. The iPad will be the student’s tool to use for school. We expect that how it is used will vary based on subject area. The expectation is that the iPad will be utilized across all disciplines. Q. What if a student forgets to bring the iPad to class? A. If students fail to bring their device to class, they will be available to check out a “loaner” iPad to use for the day. Q. Is a personal iTunes account required? A. In order to download certain apps and for all iTextbooks, it is mandatory to have a personal iTunes account. This also allows you to personalize the use of the iPad by being able to download apps, music, etc. that are of interest to you. Q. Will there be a loaner program? A. The school will maintain a stock of loaner iPads, but this will be primarily for students whose iPads are under repair. Students must sign off on loaner iPads and accept responsibility for that loaner unit while in their possession. Q. Why an Apple iPad instead of an Android tablet? A. The Apple iOS operating system is a simple, stable platform with a well-defined App Store. Applications available through the App Store are also pre-approved by Apple to be safe, secure, and stable. The Android market has limited controls and limitations on application development guidelines; thus these devices would propose a greater of a risk for students and faculty. Android functions vary depending on hardware. Apple comes in very limited configurations making support much simpler. Q. What if my issued iPad is lost or stolen? A. You will be responsible for the current replacement cost of the device. Lost iPads must be reported to Campus Security and IT Support Services immediately. A loaner iPad will be issued during the time it takes to replace the iPad. After the replacement of equipment a student will be charged the full replacement cost. Q. What happens if my issued iPad gets broken? A. You are responsible for the full repair cost. If an iPad is found not to be repairable the iPad will be replaced at the current device replacement cost.